I had a super crazy day at work today, and I'm really looking forward to Friday being a quiet day. I need a break after this busy week! Does anyone have any plans that they're looking forward to? If things go right, I hope to spend some quality time with DH and with my brother who is visiting from SF. I was recently loaned a Deborah Lippmann polish called Shoshanna, a color that I'd never seen before. I looked it up and realized that it is from the Girls Collection based after the HBO series Girls. My coworker, who loaned me the polish, got it from the nail salon next door. They were giving out free manis and little did I know, free DL polish with each mani. I wish I hadn't missed that offer, but I was grateful to have the chance to wear this polish. 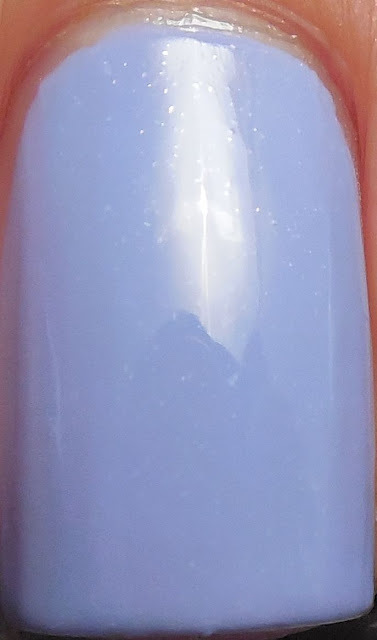 It's described as a virtuous vivid violet, but I found it to be more of a "french lavender" shade aka a light lavender with strong blue undertones. There's also a shimmer in there but it's really subtle and didn't really translate onto the nail. In any case, hopefully the color represents the character of the show well, unfortunately I don't have HBO so I don't know. I do know that the formula was smooth and easy and I used only two coats and followed with a layer of SH Insta Dri. I think this available for order from Deborah Lippmann online, but otherwise I haven't see much info on the collection or this color. The other colors from the collection do look intriguing, especially Hannah, which is described as a hapless hunter green. Have there been any DLs that you've been lemming?